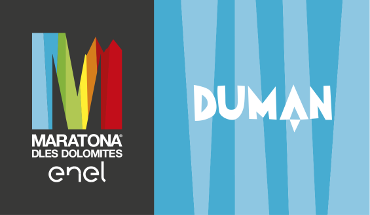 The theme chosen for the 31st Maratona dles Dolomites – Enel was LOVE. "We pedaled, struggled, and rejoiced together, we celebrated and shared moments of joy and happiness. We grew up, we opened our hearts and welcomed love, the greatest gift of all. Nothing will ever be the way it was before — that’s right, because while cycling we move and we evolve, facing fatigue we grow, in contact with others we reach distant horizons which we would never have reached out alone. Love is the strength thanks to which we are able to be here, in the midst of these wonderful mountains. It doesn’t matter if we reached the finish line or not, what is important is the shared experience, having faced it together, being armed with courage and determination. Because love is made of the courage and determination to believe in one’s values. 9.129 cyclists started the Maratona on sunday 02nd July 2017 at 6.30 a.m from La Villa. A long, big snake of cyclists that took about 36 minutes to begin the race with a gorgeous landscape and an enchanting and exciting music to incite the start. That’s a high numbers’ mechanism with more than 33.500 pre-registrations but a limited numbers race; the Dolomite passes closed for all the race long; charity’s objective and eco-sustainable way to live the race with electrical cars and motorbikes for internal use. Among the participants there was for the first time also Sir Bradley Wiggins who is not just one of the world’s most famous cyclists, an exceptional track racer and a time trial record holder. His successes include also the Tour de France and several Olympic gold medals. “I really enjoyed it although it was very tough” were the first words of Sir Bradley Wiggins at the finish line. A game which twists and turns through the 7 Dolomite passes: Pordoi, Sella, Campolongo, Falzarego, Gardena, Valparola, Giau, strarting from La Villa and finishing to Corvara. 3 routes: the long one of 138 km and 4230 mt of altitude; the medium one of 106 km and 3130 mt of altitude and Sella Ronda of 55 km and 1780 mt of altitude. Half the cyclists are Italian, the other half are a heterogeneous group from five different continents: Germany, Great Britain, the Netherlands and Belgium will represent Europe; Qatar, Japan, Korea, Colombia and Kazakhstan, are only some oft he nationalities of the cyclists travelling from afar.